Congratulations! Click on the link above to see what your choices are. Winners, if you've given me a way to contact you I'll be in touch. If not, then it's up to you to contact me by the end of the week, or I'll select another winner for your prize. Now, what do I mean by "How To Print Your Prepper Copies of My eBooks"? The copyright for each of my The Little Series of Homestead How-Tos eBooks includes this statement - "Purchaser is granted permission to make one print copy for their personal preparedness files." This post is going to tell you how to do that. If your copy came from Smashwords, then you have the easiest go of it. Once you've purchased a copy (with either cash or coupon) you're entitled to download updates plus other formats of the book. Simply select the PDF version to download and make your copy from that. I'm sure I don't need to ask you not to make multiple copies for your friends and family; the copyright permission is for Purchaser to make one copy for themselves. 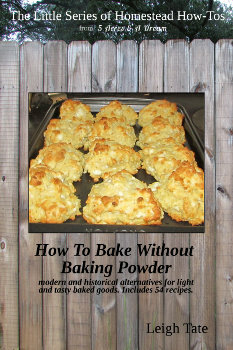 Writing and selling books is the way I help support the financial needs of our homestead. Regular readers of my blog know we struggle financially. I could put a "tip jar" widget on my sidebar, but I'd rather trade useful information for money than to ask for it for free. Self-earning (as opposed to working for someone else) is part of my self-sufficiency formula. Research, writing, and experience are what I have to offer. Questions? Ask and I'll answer if I can. Winners! If you don't hear from me please contact me by the end of the week so I can get your prize to you. And everyone, please stay tuned. I have more eBooks for this series in the works, which likely means more giveaways. Also I have plans to "bundle" like topics for both electronic versions and paperbacks. Want to know when new books in the series become available? As excited as I get about publishing them, I don't want my blog to turn into one big ad. 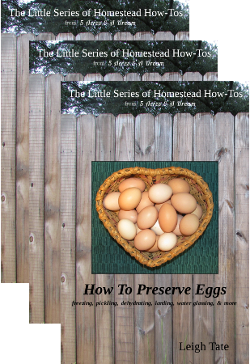 So to know when new titles become available you can bookmark my The Little Series of Homestead How-Tos webpage, here, like the series' occasionally updated Facebook page, here, or just keep an eye on my sidebar. a BIG congratulations to all the winners! this was a great giveaway Leigh! Wow Thank you so much Leigh! I'm dead chuffed with this - thanks Leigh! Wow! I've never won anything before! How exciting! Thanks, Leigh! So excited! Thanks so much for your wonderful book!